The Dallas ISD Board meeting this Thursday at 6:00 pm will cover increasingly critical items. I am signed up to address items: 6.01 and 7.03 on the current agenda. Concerns about 6.01 will address conflicts of interest that continue to this day of board members with documented interests in and work with charter schools. 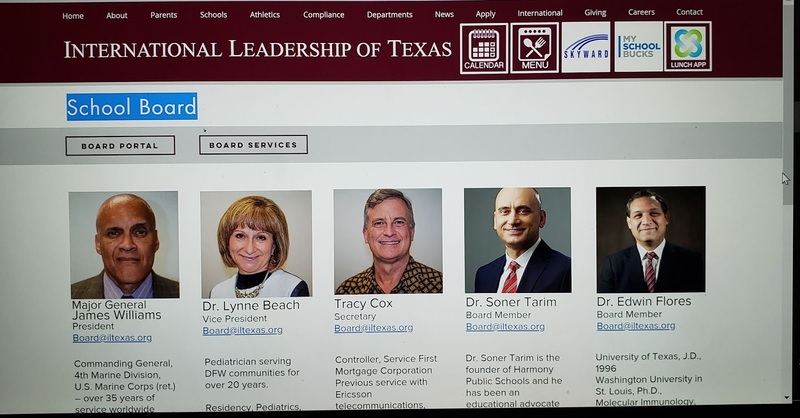 Here is the online listing today for the International Leadership of Texas (ILT) Board on which DISD Board President Edwin Flores sits. International Leadership of Texas (ILT) is not physically inside DISD, but there is little doubt it is serving children from inside DISD, and/or children from outside DISD who could easily attend DISD schools in the current open-enrollment atmosphere. There is no documentation in the Dallas ISD Board Conflict of Interest files for Mr. Flores, or for any trustees, to show that such conflicts have been documented. While the student achievements at ILT are similar to achievements at DISD according to the most recent Texas Academic Performance Reports, ILT has twice the percentage of students who are not affected by family poverty. ILT also has almost three times the percentage of students who are not affected by any educational disability. This is data taken from the 2017-18 Texas Academic Performance Reports. 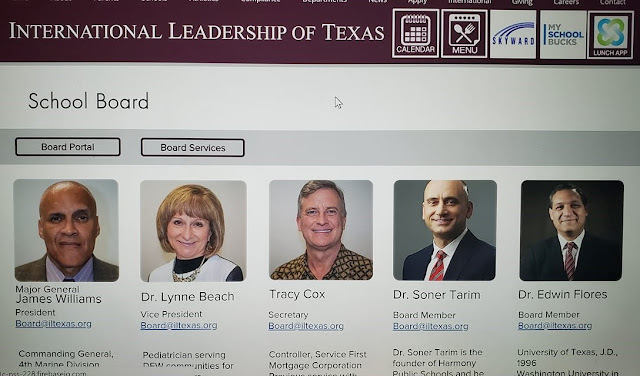 Is the goal of the DISD trustee on the ILT Board to bring ILT up to DISD standards so they can better compete for DISD students? How is that not a conflict? Item 7.03 is addressing potential contracts with pre-k providers who have a history of contracts with DISD. One issue openly discussed are allegations that some of these providers encourage parents after Pre-k to take their child to schools outside DISD. How can you decide on these contracts without having a report on the percentage of their pre-k students that have a history of then enrolling the next year in DISD schools? Due to today's very misleading Dallas Morning News Editorial I must focus the errors DISD is spreading to the public that are reflected in this editorial. The TEI system is focusing teacher raises on the highest White enrollment schools and on the schools serving the lowest percentage of children from families of poverty. A study was done this past November using data from an open records release covering the average teacher salaries in each DISD school over the past three years. The data showed a $423 difference in 2015 between the 20 schools with less than 70% poverty and the 216 schools with over 70% poverty. Over the next three years under TEI that difference exploded to $3,953! This also contradicts today's Dallas Morning News editorial. Significant corrections are needed to TEI! The most consistent issue driving all these problems is an ongoing lack of transparency within DISD. About two years ago there was active trustee discussion during board meetings about having a report made on the students trasferring during the school year into Dallas ISD from charter schools. They wanted a report to be made on these students as to achievement status and the schools they were transferring from. Then a person sitting on a charter board became DISD Board President and these discussions were never repeated nor were any such reports made public. Where are these reports? Other transparency discussions and proposals given to the board include expanding the School Information Files, now online at the DISD Data Portal. The proposal made was to add about 200 additional variables for each school to these initial 40 variables given for each of the 266 schools and academies. This data is now available in a 40 item spreadsheet with each of the 266 schools and academies being one row in the spreadsheet. Lack of data transparency underlines the hypocrisy of Dallas ISD in claiming to be working toward racial equity. What is DISD hiding? 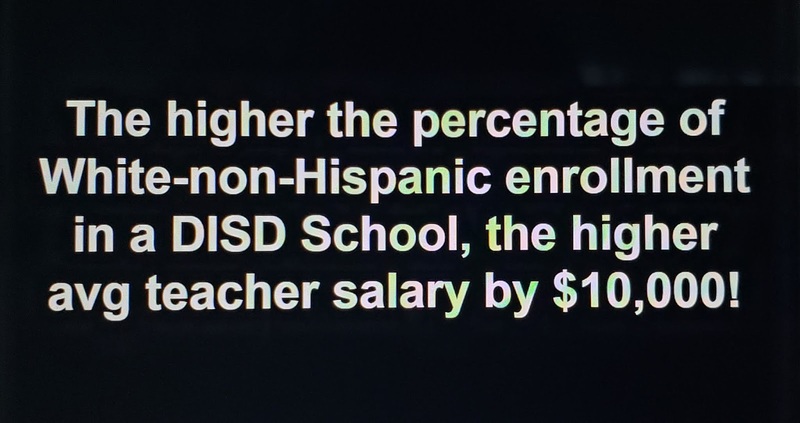 It is much more than having teachers in the 3 schools with over 50% White students now making almost $10,000 more than the average salary of all other 98% of teachers in DISD serving schools with less than 50% White enrollment. It is much more than the average $423 more that teachers in the DISD schools with less than 70% poverty were making in 2015, and that difference exploding to $3,953 after three years of TEI. Where can we go to verify that all DISD schools are being funded equitably with one simple look at the data and without having to spend hours collecting data from multiple sources? Africans traveled to the Americas and dominated some American cultures thousands of years before Columbus! African DNA is common in Mexico and South America. We are finding that slavery was probably NOT the major method of the immigration from Africa but happened after thousands of Africans immigrated as leaders, architects, and probably conquerors! This article lists the expanding evidence being found. It is from an article from the Atlanta Black Star at: https://atlantablackstar.com/2015/01/23/10-pieces-of-evidence-that-prove-black-people-sailed-to-the-americas-long-before-columbus/? "The Olmec civilization was the first significant civilization in Mesoamerica and deemed “Mother Culture of Mexico” by some historians. 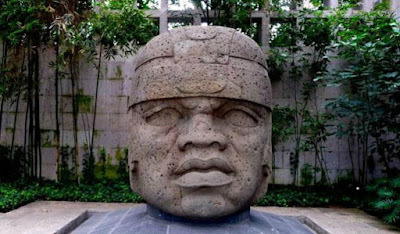 This civilization dominated by Africans is best known for the colossal carved heads in Central Mexico that serve as even more evidence that Africans sailed to the New World before Columbus. The heads are clearly crafted in the likeness of Africans. The same civilization that created these giant heads was also responsible for introducing written language, arts, sophisticated astronomy and mathematics to Mesoamerican civilization, ancient African historian Professor Van Sertima explained." "According to Paul Alfred Barton, the author of “A History of the African-Olmecs: Black Civilizations of America from Prehistoric Times to the Present Era,” ancient kingdoms in West Africa have a long history of trade by sail, which made it all the more likely that they eventually expanded their trade to the Americas. While the Sahara is a dry desert today, its past as a lake-filled, wet and fertile place has been well-documented. 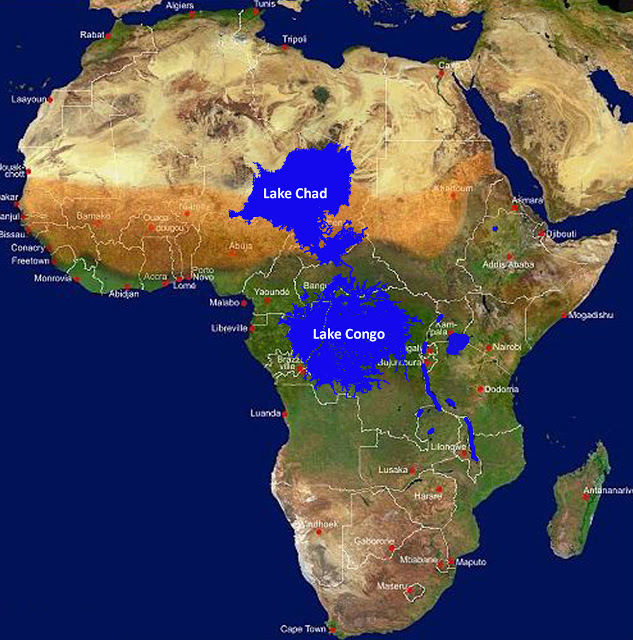 African ships often crossed these large lakes to get from place to place and traded with other African civilizations along the way. After expanding their trade to the Americas, they certainly made their mark as things like African native cotton were soon being discovered all across North America." 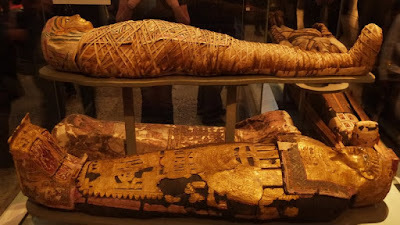 "The discovery of American narcotics in Egyptian mummies has left some historians amazed. Recently, archaeologists discovered the presence of narcotics only known to be derived from American plants in ancient Egyptian mummies. These substances included South American cocaine from Erythroxylon and nicotine from Nicotiana tabacum. German toxicologist Svetla Balabanova reported the findings, which suggest that such compounds made their way to Africa through trans-Atlantic trade that would predate Columbus’ arrival by thousands of years." Above are only 3 of the 10 facts posted in the Atlantic Black Star Article online at https://atlantablackstar.com/2015/01/23/10-pieces-of-evidence-that-prove-black-people-sailed-to-the-americas-long-before-columbus/? For thousands of years education has been driven by teachers who focus on helping students know their roots and form life goals, developing the tools they must have to achieve those goals. The School Time Capsule Project has created a structure to expand the focus on roots and goals throughout the 14 years leading to graduation. Every year, from pre-k through high school graduation, each parent is invited to write a letter to their child about their dreams for their child. First by the school, then in third grade students begin the process of writing an annaual letter to each parent asking for a letter back about their dreams for them, and asking that a story from their family history be included. As the years pass these letters from the students will naturally change, and be sent to more family members, especially those who are older and know more of the family history. Grandparents, great grandparents, aunts and uncles, and other relatives can be written to as the student expands their awareness of family history. Each time a student receives a letter from a parent or other relative they are encouraged to immediately read it so they can ask that relative about any details in the letter they may not fully understand. Such conversations could evolve quickly into those goal-centered/family history discussions that we all want to be more common in all families. The letters from parents and relatives, or anyone the child is close to, are collected by each student to be brought to school on an assigned day for the second letter writing exercise. In that class the first assignment is to prepare a self-addressed envelope to hold all of the letters. Then each student writes a letter to themselves about their life and their own goals. As this is done the teacher checks all of the envelopes to be certain they are addressed correctly so they always find their way back to the student. The letters are all placed inside the envelope, sealed, and placed into the School Time Capsule. Each year the letters are returned before the next letter writing exercise. The most gerrymandered Dallas City Council districts have ALWAYS been the minority-majority districts in Dallas for several reasons related to continuing the White-Non-Hispanic majority on the Dallas City Council. That majority was continued in the 2011 redistricting even though the Dallas White-Non-Hispanic voting age population was only 34%. 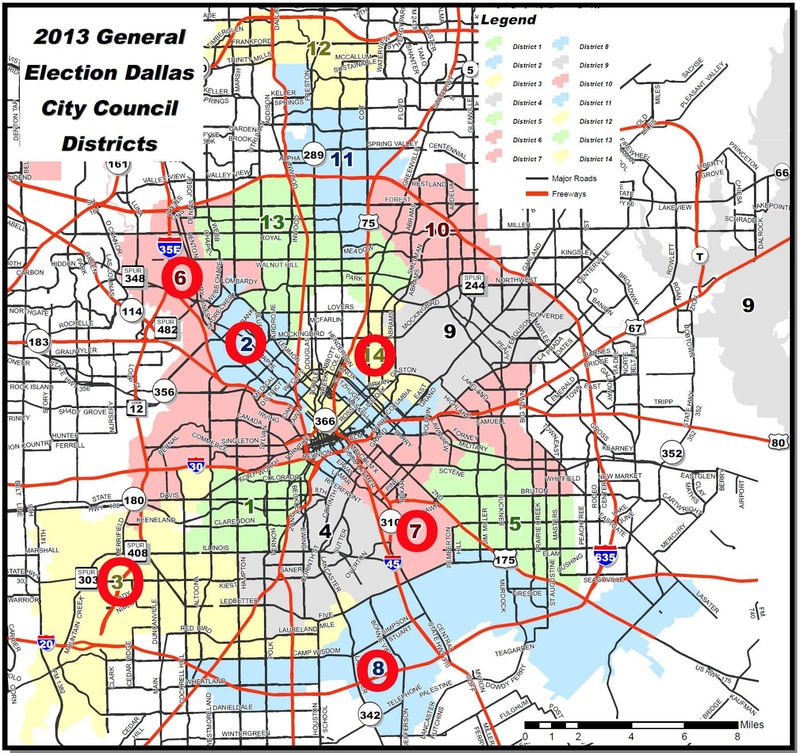 Gerrymandering confuses voters, lessens voter turnout, lessens community contacts with council representatives, and makes campaigns for office expensive and more dependent on people with money, usually in North Dallas. The 2001 map had 9 gerrymandered minority districts, circled in red above, where the gerrymandering was NOT needed to increase minority representation but to help keep a White majority on the Dallas City Council and/or help minority candidates to be dependent on North Dallas Money to run for office in the strangely shaped, expensive-to-run-in, districts. For the first time in 2011 there was an intentional effort to lessen district gerrymandering. The 9 such districts in 2001 were reduced to 6 in 2011. These districts are circled in red in each map. That was progress, just not enough. Below are the demographics for the above adopted 2011 map. 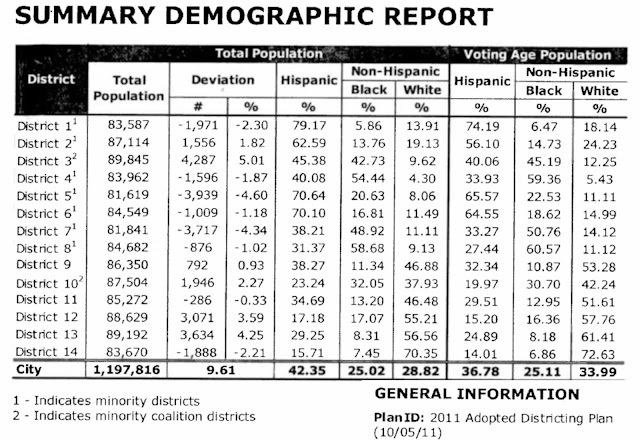 Notice how White-Non-Hispanic population was able to dominate 43% of the districts numerically with only 34% of the Voting Age Population. 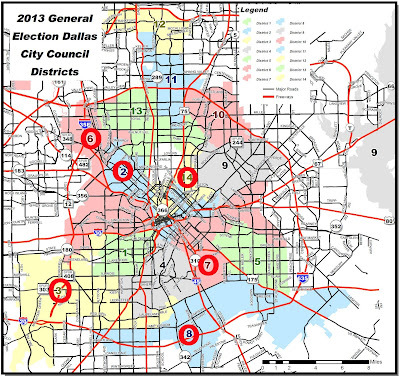 Also, as the map clearly shows, 6 heavily and unnecessarily gerrymandered districts remain to fragment communities, lessening turnout, and making political campaigns more expensive, increasing the potential for a dependence on North Dallas Money. 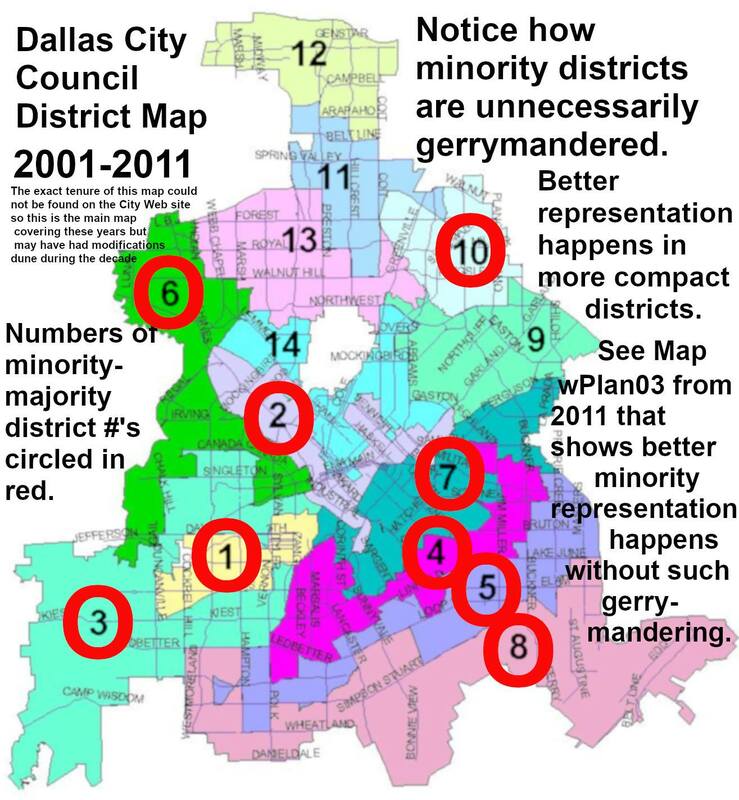 Below find the much more compact, much less gerrymandered map that would help gain minority representation on the Dallas City Council. 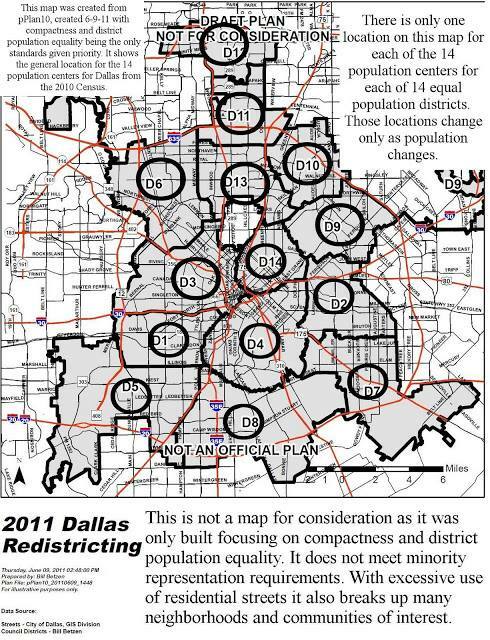 It is the map that Mayor Rawlings supported in 2011, but it was not selected by the Council. Below is the map of the 14 population centers with the 2010 Census that helped develop Rawling's Map with less gerrymandered districts. The same steps must be taken once the 2020 Census data is available for the 2021 Redistricting Process. 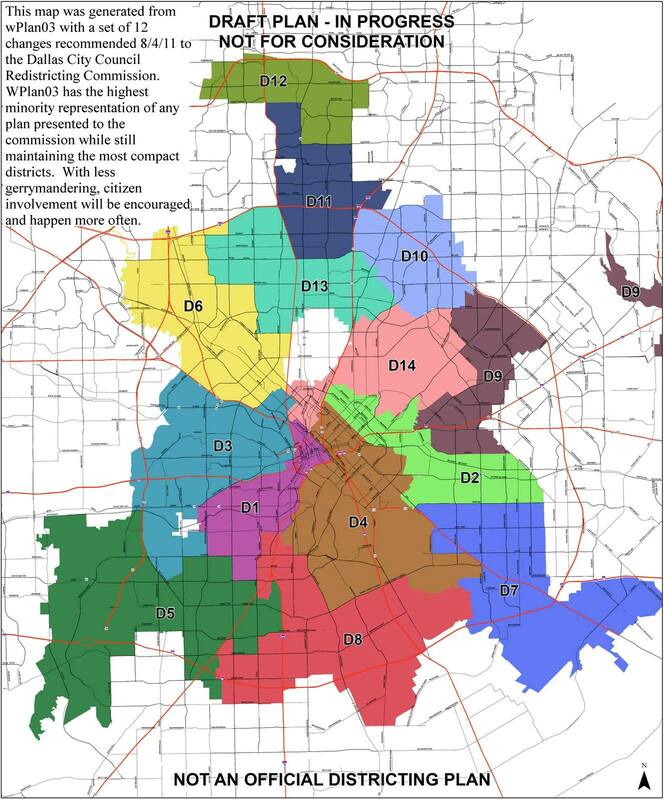 With the 14 population centers calculated from the 2020 census numbers Dallas will be able to redistrict so that the boundaries are compact, logical, minimize neighborhood fragmentation, and encourage voters to vote. We must minimize gerrymandered districts that fragment neighborhoods and require more funding for candidates to run a successful campaign. The Mayor Rawlings Map in 2011 relied on using the Trinity River as a major boundary to create the two Pleasant Grove Districts. As I recall this map never used less than a 6-lane major street as a boundary anywhere. That helped lessen neighborhood fragmentation. The more involved Dallas Citizens become the greater our city will become! Majority White Schools have higher Dallas ISD teacher salaries. There are only 3 schools in DISD that are over 50% White-non-Hispanic. They are Lakewood Elementary, Mockingbird (formerly Stonewall Jackson) Elementary, and Travis Middle School. The average School Effectiveness Indices (SEI) in these three schools is only 52.0. Even the 20 lowest poverty schools in DISD, which these three are among, had average 2017/18 teacher salaries of $56,118 while the remaining 216 or so schools with over 70% of students living in poverty had average salaries of $52,165. 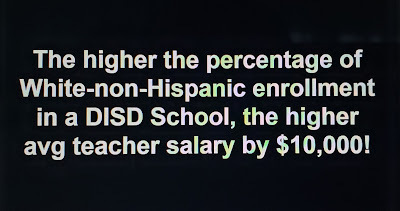 That means that these three "most White" schools enjoy teacher salaries that are the highest of the high, and $9,859 higher than the average teacher salary in the 216 schools, over 90% of all DISD schools, with over 70% of student living in poverty!! The 96% of Dallas ISD schools with lower average teacher than the three 50+% White schools includes many WONDERFULLY high performing schools. Among the best are the Young Women's STEAM Academy at Balch Springs Middle School which has enjoyed an average SEI of 60.2 over the past three years, a score that has also risen every one of the past 3 years. A score that is 8 points higher than the three 50+% White schools! Two of those three years they had the highest SEI scores of ALL middle schools! BUT the average teacher salary at this VERY high performing, 91% high poverty, 1.3% White-non-Hispanic middle school is only $55,318, over $6,500 less than the three MUCH lower performing 50+% White Non-Hispanic schools. Is this a battle that should be fought? How hard? The hidden "under-achieving-status" of students transferring mid-year between publicly funded schools. That idea stopped and has never been made public again. Why? 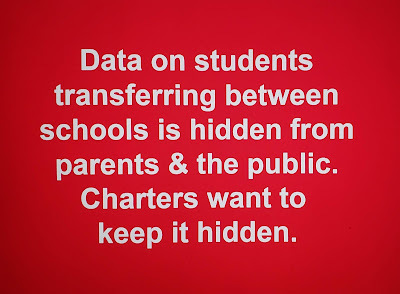 I have been studying multiple TAPR (Texas Academic Progress Reports) on charter Districts and ISD's and began to notice missing information such as student transfer data that would allow academic achievement to be identified with the transfer students. This appears to be the most critical. I am building a spreadsheet comparing DISD with Dallas County Charter Districts. I am working to identify the most critical variables and welcome ideas. Yes, DISD is looking good. Parents need to be studying TAPR reports on schools they are considering before they enroll or transfer their child.